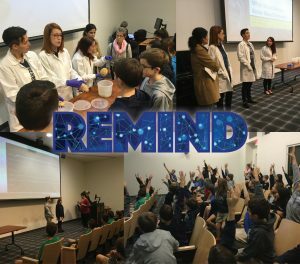 REMIND predoc and postdoc trainees, Sarah Royer, Stefânia Forner, and Alessandra Martini, welcomed 7th and 8th graders to campus today to teach them about brain health and Alzheimer’s disease. The students even had a chance to see their own brain waves in action! This outreach initiative is led by the Beall Center for Art + Technology at UC Irvine to engage local K-12 students in science, technology, engineering, art, and mathematics (STEAM).